This last weekend I explored the Long Beach Antique Market with some first-timer friends (thanks Colleen and Jade for coming with. I wasn't sure what I set out to find - sometimes I go with a goal in mind to find something specific, like a gift for someone or a needed item for our house - but this time was pure exploration, just waiting to see what spoke to me. As you can see from the photo of my treasures above, it was a jewelry/trinket kind of day. 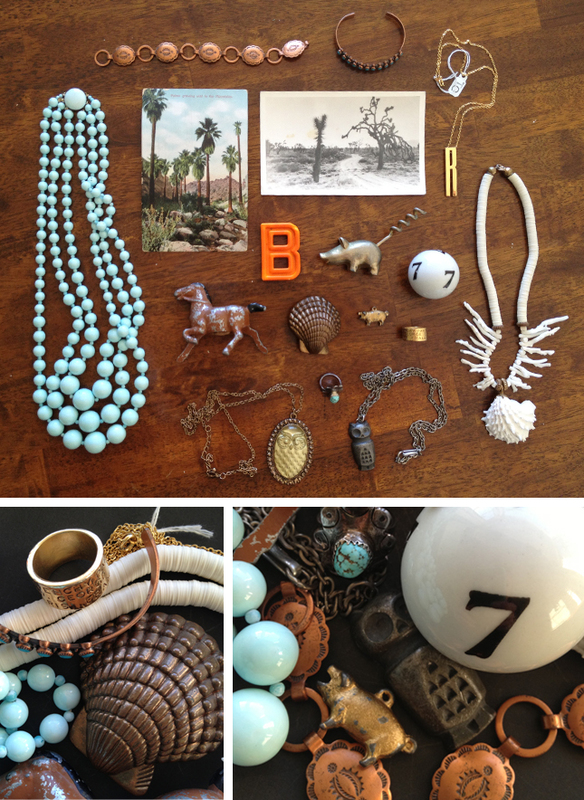 Copper navajo bracelets, old dessert postcards, a 7 ball for my 7 number collection, a couple little pigs, vintage owl necklaces, an orange B, rad coral and mint necklaces, and probably my favorite find - the gold ring that has 'Givenchy Paris Av. George V Paris, France' stamped into it.